Erin Blegen: My Scrap Cabin: Blue Fern Studios Design Team~! 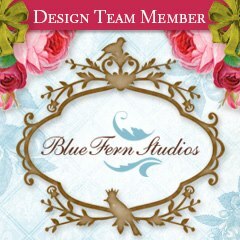 I'm so excited to share with you that I've taken a Design Team/Marketing Director position at Blue Fern Studios~! Blue Fern Studios is a brand new papercrafting manufacturer located in the United States, currently specializing in original & sophisticated chipboard designs, designed by the very talented Michele Singh. Not only does Blue Fern Studios have one amazing premiere design team, but an impressive collection of designs already available. Just take a look HERE~! I'm thrilled to take on this new role and look forward to being a part of what is certain to become a fierce competitor in the papercrafting industry~! If you want to get some Blue Fern Studios product for yourself, you need to get your local scrapbook store on board- send them HERE to sign up and place an order (or they can contact me at: erin@bluefernstudios.com). You can also check HERE for retailers currently carrying Blue Fern Studios designs, and HERE these products are already being sold~! Have a fabulous night/day and thanks for stopping by~!! Congratulations Erin ... I'm thinking that you are going to be just busy enough in the coming months ... but a 'good' busy, if you know what I mean - enjoy the challenges ahead. You go girl!!! Congrats!! What a wonderful and awesome opportunity! I wish you much success!! Huge congrats on making their design team! That is so exciting! I can't wait to see what you will create with their beautiful chippies. Wow! A big congrats to you! Wow Erin, that's awesome! Congratulations and best of luck! Congrats, Erin! I don't think I've heard to this company but I can't wait to see their product in use. a huge congrats!! i have not heard of this company but i will head on over to check it out!! Congratulations Erin! You are going to rock this! What awesome news Erin!! Big Congrats to you on making the Team, and the Marketing position you'll be taking on! And how fun that you and Kelly get to be on the Team together!! :) Lots of great talent...including both of you!! Congrats, Erin! This sounds like an amazing opportunity...I'm so happy for you!